You are at:HomeUncategorizedSmall Talk: Got it down yet? Small Talk: Got it down yet? ﻿﻿﻿﻿﻿ Perhaps you just arrived here from another place where small talk does not occur very often (such as the polar ice cap, inside a volcano, etc.). Maybe you feel completely lost when a stranger strikes up a conversation with you at Jiffy Lube, maybe you feel socially awkward and have no idea what to say when standing in the Wal-Mart Customer Service/Returns line with the chatty grandmother in her Tweety Bird shirt OR MAYBE you blab your face right off about your collection of belly button lint in the quiet doctor’s office waiting room with a complete, horrified stranger. If any of those descriptions describe you, my friend, perhaps you need to check yourself before you wreck yourself by taking this quiz. 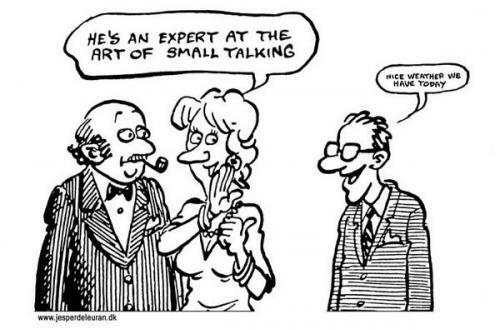 What IS small talk? Small talk usually does not happen by choice and occurs many times with a stranger, a mere acquaintance or a friend you haven’t seen in a long time. It also typically happens unexpectedly, in a very predictable way and around a set number of topics at places like the copy machine at work, while waiting for the dang Starbucks barista to hurry the heck up, community mailboxes. etc. The type of small talk we’re talking about today, class, is the type that is meant to occur in only a few minutes. For example, you are walking out of the grocery store to your car and you happen to see someone you graduated with from high school. You are both carrying three large watermelons each. You have made eye contact, you’ve been asked a question and now must say something. What is it that you say?? #1 How are the kids? A- No, I am just gettin’ over that stuff that was “going around”. I’m not contagious anymore. B- No, it’s just allergies. #3 Don’t you like this cool weather? B- Yes! It was great getting our jackets back out again. C- You betcha!! I drive around everywhere with the windows down. #4 Did you see that game last night? A- Yes! Wasn’t that play at the end awesome? C- No, I didn’t get to watch it. What happened? #5 Are you going to vote today? C- VOTE??? Are you kiddin’ me??? My vote doesn’t cay-yownt! I bet they’ll count the votes hwrong eeenyway. ‘member those “cha-yads” back in the Gore/Bush election?? “Swinging cha-yads”, even??? I tell you what I feel like swinging- a bat at all them votin’ booths! Nobody leestens to what I’m saying no way! What? They’re all electronic now? Computers. Give me a break. I bet they go in and mess up our votes somehow or ‘nother. No, no…votin’ ain’t ferrrr me! I’m going to sit RAHT here and watch the “PRAHS EES RAHT” all afternoon long, pard’ner, and I don’t won’tchu geevin’ me heck ’bout it neither! If you didn’t answers all D’s, you may need to consider going in for some Official Small Talk Training that I will be offering at your local community center next month. Lemme know if I should look for you.